Kenya's Eliud Kipchoge and Gladys Cherono (R) celebrate during the victory ceremony after winning the men's and women's 42nd Berlin marathon, in Berlin, Germany, Sept. 27, 2015. Kenyan favorite Eliud Kipchoge shrugged off midrace footwear problems to win the Berlin marathon on Sunday with a personal best time of 2:04:01 but missed out on a world record by more than a minute. The in-form 30-year-old, a winner in London in April, proved a master of the flat, inner-city course, regarded as the fastest in the world, even as his insoles slipped out of his shoes early in the race, winning ahead of fellow Kenyan Eliud Kiptanui and Ethiopia's Feyisa Lilesa. "At some point they started coming out, but I had no time to remove them," Kipchoge told reporters. "But when you run without soles, there is a lot of impact. There was a lot of pain with every step." "The world record was really my aim, but it was not my day for it," he said. "But I ran a personal best and I am happy and I will come back next year for it." 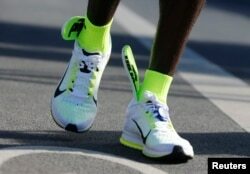 The insoles of Kenya's Eliud Kipchoge's running shoes are seen slipping up to his ankles, after he crosses the finish line to win the men's 42nd Berlin marathon, in Berlin, Germany, Sept. 27, 2015. Fellow Kenyan Gladys Cherono clocked 2:19:25, winning the women's race ahead of Ethiopians Aberu Kebede and Meseret Hailu. Kipchoge, a former double Olympic medalist at 5,000 meters, quickly led a group of six runners, including fellow Kenyans Emmanuel Mutai and Geoffrey Mutai, as they broke away from the pack on a sun-drenched autumn morning. The Kenyan looked unaffected when the insoles of his shoes started slipping up to his ankles and flapped against his calves with every step. But it was Geoffrey Mutai, who won here in 2012 and was one of the prerace favorites, who dropped back first, failing to keep up with grueling pace. Kipchoge, undeterred by his footwear mishap, pulled away after 32 kilometers, gradually building up a 30-meter lead over his rivals and extending it as he cruised to victory with his new-found footwear wings still flapping.